Where am I? - somewhere at sea in the coral sea off Northern Australia, starting the journey home to Sydney. Guest blogger #10 is Jasmine from Nailed By Jasmine. She is sharing a recent NOTD she created with some free hand nail art and indie polishes. Jasmine, over to you. 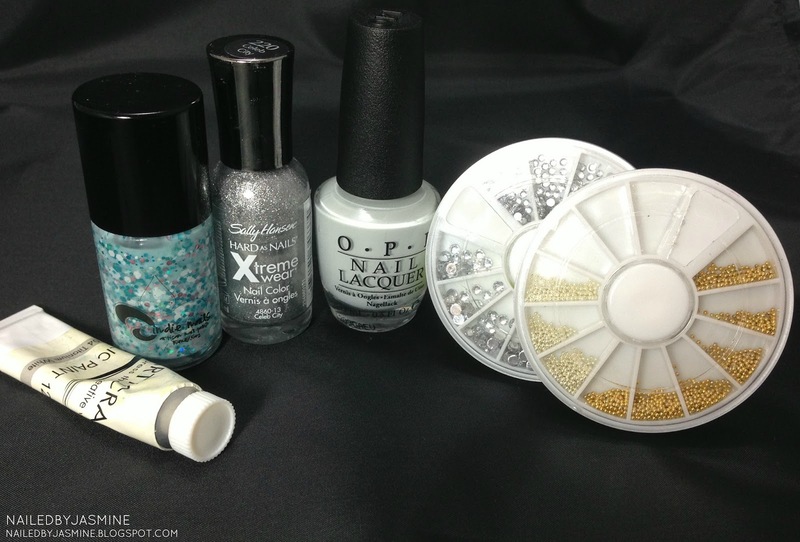 Hello lovely readers of More Nail Polish! I'm Jasmine from Nailed By Jasmine and I'm so honored to be guest posting here today. When I was thinking about what I could show you, I kind of stressed a little lol. This is because Cathy produces amazing blog posts, which are informative and creative so I've given this manicure my best shot! Today I'm showing you my recent NOTD, I got this idea from a photo (clicky here) that I found on Pinterest. I wanted use an Indie polish as my base to spice it up a bit from the original version. This is what I whipped up. I kind of have a love/hate relationship with the nail art that I produce because I used to only wear plain polish, so when I look at my nails now, sometimes I say 'Wow that's crazy!' and that's what I'm feeling now. Moving on to the polishes that I used. For my base, I used three coats of Jindie Nails Snow Angels. Snow Angels is absolutely gorgeous but I found the polish to be a little thick for my liking so I'll add some thinner next time around. 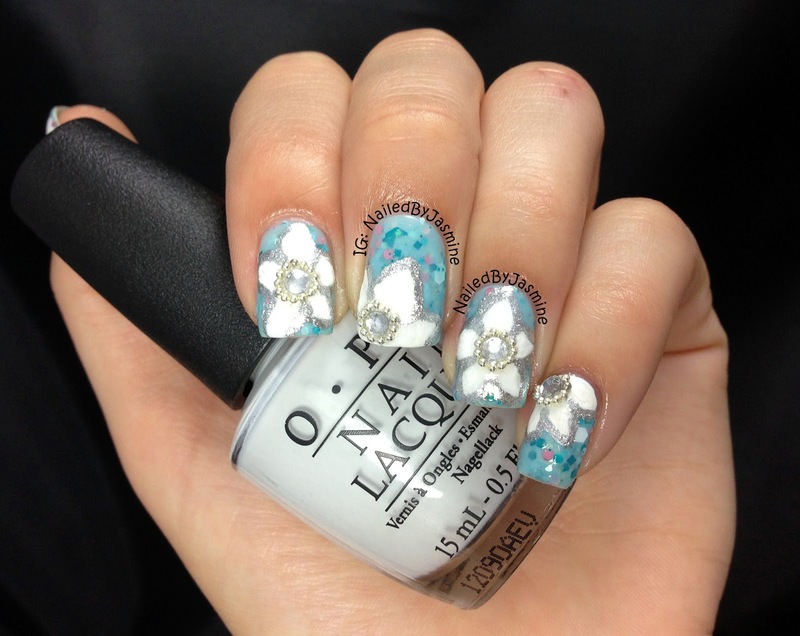 I should have taken a photo with Snow Angels on it's own but I was too keen to start the nail art >.< For the flowers I used OPI My Boyfriend Scales The Walls and white acrylic paint. For the outlining of the flower I used Sally Hansen Celeb City. The rhinestones and beads can be purchased on Ebay for a couple dollars. Really love this nail art :) The flowers and rhinestones look quite delicate, but the glitter as the base makes it look very different overall. I really like this look and love that you used an indie as a base! they look like they're floating on water, the polish you use as the base is beautiful!